A Simple Kinda Life: See Super WHY in your local theater! 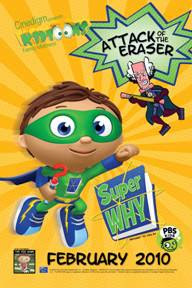 Two SUPER WHY episodes, Comic Book: Attack of the Eraser and The Big Game, will be in movie theaters on weekends in February as part of the Kidtoons program. Soar to new places in February with SUPER WHY, as Super Why, Princess Presto, Wonder Red, and Alpha Pig go on reading adventures like you’ve never seen before. Wham! Pow! Bam! Join the superheroes inside a comic book, where they’ll use their literacy powers to stop the diabolical eraser from erasing the words in Reader Valley in Comic Book: Attack of the Eraser. Then get ready to cheer for Super Why and his friends as they learn the importance of practicing in The Big Game. Visit http://www.kidtoonfilms.com for more information and to find SUPER WHY in a movie theater near you! Super Duper! The Kidtoons program is dedicated to helping parents connect with their kids by bringing family friendly animated movies to the big screen every weekend at participating theatres across the country. Participating Kidtoons theatres showcase a fun, affordable family friendly matinee movie and provide a family experience filled with entertaining, kid-friendly characters, as well as cartoon shorts, music videos and sing-alongs before each movie. We even have fun giveaways for the kids, such as stickers, temporary tattoos, activity books or toys after every film. Disclaimer: I received no compensation to write this post. I'm sharing it for the benefit of my readers. I'm heading over to see if we can see Super Why in the Theater. Paige loves that show...and truth be told, so do I! !